When it comes to training the muscles of the body, slight variations on the angles of exercises can have a profound effect upon the number and location of muscles fibers being stimulated. Many bodybuilders make a major mistake in not adjusting their training angles and grips over time. Their bodies become accustomed to the same movements, and stop growing. Additionally, there are groups of muscle fibers which are never stimulated, as they’re not in the “line of fire” of that particular movement’s range of motion. It’s important to rotate angles and grip approaches to ensure you are stimulating the muscle group in every way possible. The flat bench press works the central chest. If you set the bench to decline by 15 degrees, you are suddenly hitting an entirely different set of muscle fibers, the lower chest. Or, if you raise the incline by 30 degrees, you are suddenly placing the emphasis upon the upper chest. It’s incredible to think that just an inch or two in either direction, over the course of just a few months, can have such an enormous effect upon the physique we present onstage. When it comes to squats, bar placement means everything. Have a friend snap a few pictures of you squatting, from the side. Take a look at the imaginary path the weight would take if it were to fall directly (through you) to the floor. The further back the barbell sits on the shoulders, the more of the emphasis is placed on the glutes and hips, concurrent with the goals of the powerlifter. The further forward the barbell site (without injuring the neck) the greater the amount of stress that is placed upon the front quadriceps. There are many different variations of grip you can use for the lat pulldowns, including close, wide, and medium. These apply to chins and lat pull-ups as well. 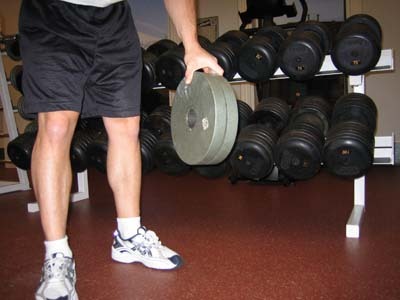 Wrist position and bench angle can be altered on many variations of barbell and dumbbell rowing as well. Make it your goal to hit the lats at a slightly different angle every time, and you’ll ensure the muscles are continually being challenged in new ways. Most bodybuilders know that using a straight produces a different set of results for the biceps than using a cambered EZ-curl bar. But did you know that selection of differing grips on the EZ-curl bar can have a major effect as well? Different levels of Supinated grip can result in the outer or inner heads of the biceps being stimulated. These methods apply to all body parts. If you’ve been training using the same grip and angles for months, or even years, it’s very likely that your muscle groups have fully adapted to that angle. You can still increase the demand by adding weight, but you limit the groups of fibers which are being stimulated. To prevent this, utilize a wide variety of angles and grips when training. Never allow your body to fully adapt. The workload should continually change in minor ways with each and every workout. This entry was posted in Training and tagged Bodybuilding, Grip In Bodybuilding, Training Angles, Training Grips, Training Tips, Wide Grips, Workout Routine. Bookmark the permalink.